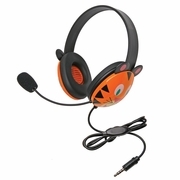 Help your beginning reader succeed with their read-alongs with this Listening First headset. Purpose built for younger students and loaded with added safety features, this engaging bear-themed headset is ideal for mobile and computer-based learning and language activities. Its To Go plug makes this headset an innovative choice for how testing can be done to meet English Language Arts (ELA) requirements within the Common Core State Standards. Adjustable headband for personalized fit Smaller overall headband to fit younger children Rugged ABS plastic construction for classroom safety Permanently attached 5.5' straight cord with reinforced "strain" relief connection resists accidental pull out Volume control for individual preferences Flexible electret microphone Ambient noise-reducing earcups lower outside noise so volume does not need to be as high for hearing safety, keeps students more on task Protective slotted baffles inside the earcups cover the speakers and help prevent accidental damage from prying fingers & foreign objects iOS, Windows, Android compatible Three-year warranty for school use - unlike headsets purchased at consumer electronics stores whose warranties would be voided if used in schools This headset has multiple plug choices to fit a variety of devices. Make sure your selected headset has the right compatible plug to fit the intended audio source.